Now, it looks like the UK’s wine lovers are about to get punished again. 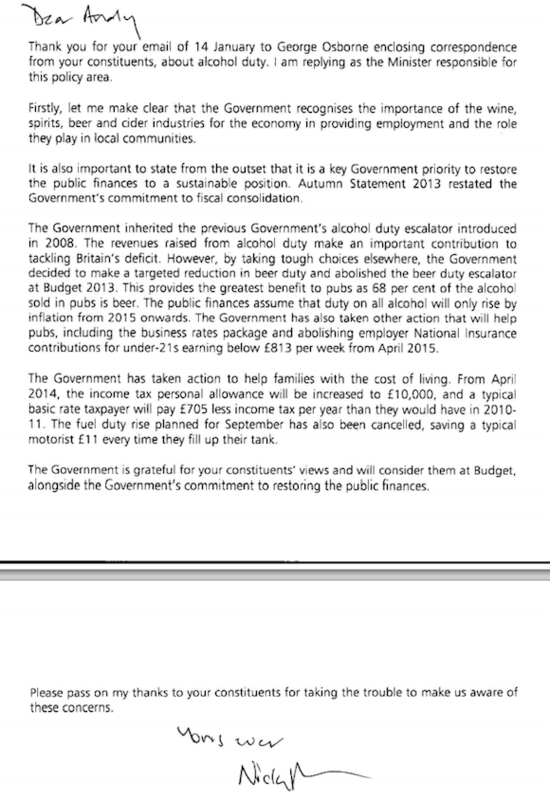 On March 19th, the duty on alcohol is set to rise by 2% above inflation in the Chancellor’s 2014 Budget (though will take effect at the beginning of the new tax year). This has happened every year since 2008, when the Duty Escalator was introduced by the previous government. Alistair Darling increased the rates of duty on alcoholic drinks by 6% in real terms, and proposed that rates would rise each year by 2% above the rate of inflation for another four years. Last year, the Chancellor scrapped the escalator on beer after heavy lobbying by the industry. 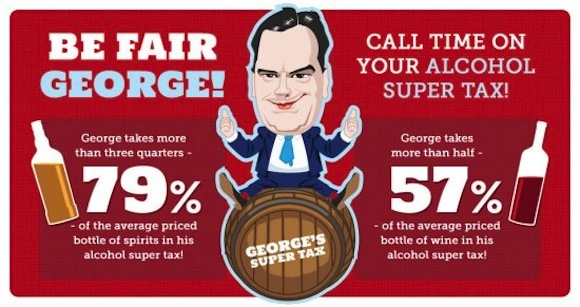 Yet wine (and spirits) went up again, meaning that tax on wine has increased 50% in five years. And it looks like it’s about to happen again. As a wine shop owner, I’m angry at the punitive taxes now levied. But, as I wrote in a post for my shop website, I DO feel unfairly penalised as a responsible drinker, too. I wrote to my MP (declaring I also owned a shop), via the Call Time On Duty campaign website and he forwarded me this encouraging reply from Treasury minister Nicky Morgan. That doesn’t mean everyone who cares shouldn’t bother writing to their MP. Quite the opposite. Voices count, as the beer lobby discovered. But you need to act right now! For more details, here are some excellent pieces articulating why it’s time to end the Duty Escalator. Thanks for linking back – it is an old story, but I hope the concerted campaign this time might have an effect, though I am not hopeful.